The Jonjo O'Neill-trained Synchronised is the 2-1 favourite for next month's Irish Hennessy Gold Cup, ahead of Quel Esprit and Quito De La Roque, both 9-2, in Coral 's opening show on the Leopardstown showpiece. "Synchronised burst a few Irish bubbles when winning the Lexus Chase at Christmas, but we don't regard that victory as a fluke, and make the 8-y-o favourite to land another big prize," said Coral's David Stevens. Less certain to participate is Jessies Dream who faces a crucial racecourse gallop ahead of a possible return to action. The David Johnson-owned nine-year-old, who has not raced since finishing second in the RSA Chase at Cheltenham in March, was among 17 entries for the Grade One feature on February 12. Trainer Gordon Elliott reports his charge in good form after returning sore from the Festival last spring. "We gave him a long break after Cheltenham, as he was a bit sore afterwards, but he seems to be in great shape again now and the plan is that he'll more than likely head to Leopardstown," said Elliott. "We'll take him to Fairyhouse to work next Tuesday and if he comes through that OK, I'd say that he'll run in the Hennessy." Quito De La Roque is also pencilled in to run at Leopardstown and his trainer Colm Murphy will be hoping for an improved performance following his disappointing display when only third in the Lexus Chase over Christmas. "He has come out that race fine, but we were very disappointed with him the last day." said Murphy. 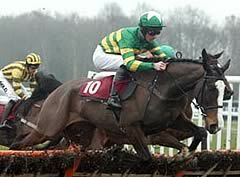 "Nothing came to light and perhaps he just had a harder race than we thought he had, when he won the Nicholson Chase. "He was a bit quiet in himself after the Lexus, but he seems to be back in good form again now and he seems to go on any ground, so we'd be hoping for a much better run from him in the Hennessy." Nick Williams has made a tentative entry for Diamond Harry, who has had a stop-start campaign so far. "He is in at Cheltenham next weekend and the plan is that he'll go there," said the Devon trainer. "But if that was called off or if he didn't make it to Cheltenham, he could go for the Hennessy." Willie Mullins, successful 12 months ago with the ill-fated Kempes, has four possibles. They are Quel Esprit, Thursday's Thurles winner Apt Approach, Blazing Tempo and Cooldine. Other entries include Paul Nicholls' The Minack, Jessica Harrington's Bostons Angel and Colin Tizzard's Hey Big Spender.